01/14/2016: Added a Wright Q4 Early Tappet Wrench. 03/15/2011: Added a Wright Early P3 Open-End Wrench. 02/08/2011: Added a Wright N500 1/2-Drive Dual-Pawl Ratchet. 09/04/2009: Added a Wright Q2 Early Tappet Wrench. 01/14/2009: Added a Wright 4435 1/2-Drive Flex Handle. 01/10/2009: Added a Wright N1 5/8-Drive Sliding Tee Handle. 12/31/2008: Added a Wright 5/8-Drive 1-7/16 Hex Socket. 12/14/2008: Added a Wright N2 5/8-Drive Extension. 08/22/2008: Added a Wright N-60 1/2-Drive Reversible Ratchet. 08/12/2008: Added a Wright MN15 3/8-Drive Speeder. 06/30/2008: Added a Wright 8417 1 Inch Drive Extension. 06/17/2008: Added a Wright 4405 1/2-Drive Extension. 05/28/2008: Added a Wright Early BW30 Box-End Wrench. 03/09/2008: Added a Wright 2435 1/4-Drive Flex Handle. 02/08/2008: Added a Wright Early N17 1/2-Drive Flex Handle. 01/30/2008: Added a Wright S160 Dual-Marked 1/2-Drive Socket. 01/27/2008: Added a Wright N23 1/2-Drive Flex Handle and a Wright K4S14 1/2-Drive Socket Set. 01/21/2008: Added a Wright 4FS16 1/2-Drive "Ten Point" Socket. 01/19/2008: Added a Wright 4425 1/2-Drive Ratchet. 12/31/2007: Added a Wright S-868 1 Inch Drive Socket. 12/07/2007: Added a Wright MN13 3/8-Drive Extension. 10/15/2007: Added a Wright 1322 Open-End Wrench. 09/15/2007: Added a Wright 1120 Combination Wrench. 05/26/2007: Added a Wright N-313 3/4-Drive Extension. 05/10/2007: Added a Wright U-311 3/4-Drive Universal. 05/03/2007: Added a Wright N12 1/2-Drive Extension. 05/02/2007: Added Wright S-15x 1/2-Drive Sockets. 04/30/2007: Added Wright S-16x 1/2-Drive Sockets. 04/28/2007: Added a Wright Early MN60 3/8-Drive Ratchet. 04/26/2007: Added a Wright N13 1/2-Drive Extension. 04/23/2007: Added a Wright Early 1/2-Drive Socket and a Wright N18 1/2-Drive Flex Handle. 04/20/2007: Added a Wright Early S-166 1/2-Drive Socket and a Wright 3428 3/8-Drive Flex-Head Ratchet. 04/18/2007: Added a Wright S-160A 1/2-Drive Socket. 04/16/2007: Added a Wright 3403 3/8-Drive Extension. 04/14/2007: Added a Wright 4400 1/2-Drive Ratchet. 04/13/2007: Added a Wright 3400 3/8-Drive Ratchet and a Wright V-17 1/4-Drive Flex Handle. 09/25/2006: Added page, no content yet. The Wright Tool & Forge Company was founded in 1927 in Barberton, Ohio, and operated initially as a maker of hand-forged automotive service tools. The founder was C. Nelson Wright, and Wright Tool continues in operation today as a privately-owned business, managed by later generations of the Wright family. Currently we don't have much information on the early tools produced by Wright, but a 1932 price list (without illustrations) provides a snapshot of that time. The price list shows a wide selection of sockets and drive tools, primarily in 1/2 square drive, but also including 3/8-, 5/8-, and 7/8-drive sizes. Sockets were available in hex, double-hex, and double-square broachings, and in deep format as well. The drive tools sliding Tee and Ell handles for all sizes, with ratchets available for 3/8- and 1/2-drive. The 1932 tool selection also included chisels and punches, open-end and tappet wrenches, double-hex box wrenches in double- and single-ended styles, adjustable wrenches, pliers, and various specialty tools. Wright sockets were apparently hot-broached or hot-forged from the beginning, and during the 1940s with company experimented with methods for forging sockets, based on patents filed from this time. By 1940 the company had begun marking its sockets (and some drive tools) with a two-digit date code, a very helpful feature for understanding the development of their tools. At some point Wright Tool apparently decided to specialize in sockets and drive tools, and production of other types of tools was discontinued. In a 1957 catalog Wright claimed to be the "largest exclusive maker of sockets and socket wrenches in the country", and as expected the catalog lists only socket tools (except for one wheel hub puller). The drive sizes covered the standard range of 1/4-, 3/8-, 1/2-, 3/4- and 1 inch square drive. The 1957 catalog also introduced a new type of socket broaching to fit both hex and square nuts, given the name "Ten Point" sockets by Wright. In 1958 Wright introduced a distinctive rubber cushion-grip handle for its drive tools. The handle was later described by design patent #D199,149, filed by H.T. Greenlee in 1962 and issued in 1964. Currently our earliest example of the cushion grip handle is from 1960. In the early 1960s Wright updated its model numbers to switch to an all-numeric system, replacing its older system of alphabetic prefixes and numbers. Some tools from around this time may be dual-marked with both the older and newer model numbers. In later years Wright Tool reconsidered its exclusive focus on sockets and resumed production of wrenches and other hand tools. The 1975 catalog (with Richard B. Wright as company president) offered combination wrenches, open-end wrenches, chisels, and other service items, in addition to its extensive selection of socket tools. The catalog notes the use of AISI 4140 steel for its sockets and drive tools. In addition to producing tools under its own name, Wright also provided contract manufacturing services for other companies. 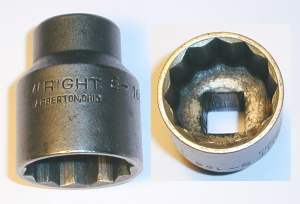 During the late 1940s and 1950s Wright produced sockets and drive tools for Billings, and the later Billings-marked sockets are believed to be exclusively from Wright. (Herbrand was also a major supplier for Billings during this period.) After Billings was acquired by Crescent Niagara in the early 1960s, Wright continued to provide sockets for the Billings brand. During the mid 1950s Crescent Tools added a line of sockets and drive tools to their product catalog, and based on the catalog illustrations, Wright was the contract maker for Crescent. The Crescent socket tools were offered in drive sizes from 1/4-drive up to 3/4-drive. Wright also provided sockets and drive tools for some major retail companies, in particular for the Powr-Kraft brand sold by Montgomery Ward. We hope to discover additional examples of retail brands produced by Wright. The Wright name was registered as a trademark with the first use date listed as January 1, 1928. In recent years Wright Tool has registered a number of trademarks, including "Wright Drive" in 1987, "Cougar" in 1996, and "Wright Spline" in 2001. Wright tools are generally easy to identify, as tools sold as part of the company's own production will be clearly marked with the Wright name. Earlier tools may also be marked with Barberton (Ohio) main location, especially those made in the 1940s and 1950s time frame. Wright sockets (and some other tools) were commonly marked with a date code in the years between 1940 and 1980. From 1940 through 1960 the date code was simply the two-digit calendar year, sometimes with a "-" or "+" prefix or suffix. After 1960 the company switched to an alphabetic code, beginning with "A" for 1961, "B" for 1962, and so on. (A few letters were omitted from the sequence along the way.) The alphabetic date codes began around the same time as new model number system, so generally one will find the new model numbers with alphabetic date codes. However, a small number of tools were still being marked with two digit date codes as late as 1963. The alphabetic codes remained in use through 1980, which was assigned the "Y" code. For 1981 and later, Wright appears to have started a new range of two-digit date codes, as some tools have been found with codes like "01". However, the interpretation of these later codes has not been confirmed yet. A 1961 Sometimes coded as "61"
Table 2 at the left shows the standard date codes with the corresponding year. Some of Wright's earlier drive tools were also marked with letter codes that probably represent dates, but we're not sure of the coding and don't have enough examples (or catalogs) to figure it out. Other early tools such as wrenches generally were not marked with letter codes, though some exceptions exist, as you will see in the figures below. For tools without date codes, the estimation of manufacturing dates must rely on other information such as tool design, patents, or catalog illustrations. Wright Tool maintains a website at www.wrighttool.com [External Link], and readers can refer there for more information on the company's current operations and products. Currently we have fairly limited catalog resources for Wright Tool, as summarized in the table below. We hope to acquire more catalogs in the future. N/A 1932 Half Yes Price list only, no illustrations. No. 57 1957 Full No Maker of sockets and drive tools exclusively. No. 100 1958 Full No Cushion-grip rubber handles available. No. 105 1968 Full No Open-end and combination wrenches available. Notes use of AISI 4140 alloy steel. Fig. 1A. Wright Early P3 1/2x9/16 Open-End Wrench, ca. Late 1920s. Fig. 1A shows an early Wright P3 1/2x9/16 open-end wrench, stamped with "Wright" and the model number on the shank, and with an early "O" date code. The faces are stamped "9/16 Op. 3/8 S.A.E." and "1/2 Op. 5/16 S.A.E. ", references to the older S.A.E. size convention. The use of the S.A.E. sizes suggests an early production date for this example. Fig. 1B. Wright Early Q2 1/2 Tappet Wrench, with Inset for Marking Detail, ca. 1930s. Fig. 1B shows an early Wright Q2 1/2 tappet wrench, stamped with "Wright" and the model number on the shank, and with an early "V" date code. Fig. 1C. Wright Early Q4 9/16 Tappet Wrench, ca. 1930s. Fig. 1C shows an early Wright Q4 9/16 tappet wrench, stamped with "Wright" and the model number on the shank, and with an early "W" date code. Fig. 2. Wright Early BW30 1/2x9/16 Box-End Wrench, with Inset for Side View, ca. 1930s. Fig. 2 shows an early Wright BW30 1/2x9/16 box-end wrench, stamped "Wright" with the model number and fractional sizes. Fig. 3. Wright Early 1/2-Drive 15/16 Socket, with Insets for Broaching and Marking Detail, ca. 1930s. Fig. 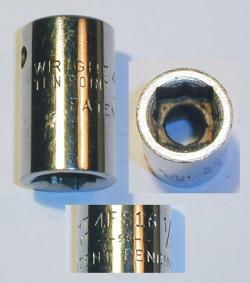 3 shows a 1/2-drive Wright 15/16 socket, marked "Wright" with the fractional size and an "S" code, but with no model number. The finish is plain steel with a rough machined surface. By the early 1930s Wright was offering sockets and tools in 5/8-drive as its heavy-duty line. Fig. 4. Wright N1 5/8-Drive Sliding Tee Handle, with Insets for Marking Detail, ca. 1930s. Fig. 4 shows an early 5/8-drive Wright N1 sliding Tee handle, stamped "Wright" with the model number and an "L" code on the drive head. The overall length is 18.0 inches, and the finish is plain steel. Fig. 5. Wright N2 5/8-Drive 8 Inch Extension, with Insets for Marking Detail, ca. 1930s. Fig. 5 shows an early 5/8-drive Wright N2 8 inch extension, marked "Wright" with the model number and a "T" code. The overall length is 8.5 inches, and the finish is plain steel with a rough forged surface. Fig. 6. Wright Early 5/8-Drive 1-7/16 Hex Socket, with Insets for Broaching and Marking Detail, ca. 1930s. Fig. 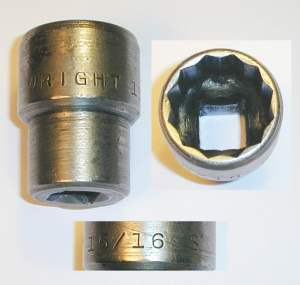 6 shows an early 5/8-drive Wright 1-7/16 hex socket, marked "Wright" with the fractional size and an "N" code. The finish is plain steel, with a rough forged and machined (turned) surface. Fig. 7. Wright S-166 1/2-Drive 1-1/8 Socket, with Inset for Broaching, ca. 1930s. Fig. 7 shows a 1/2-drive Wright S-166 1-1/8 socket, marked "Barberton Ohio" but without a date code. The finish is plain steel with a rough forged surface. Fig. 8. Wright S-160A 1/2-Drive 29/32 Socket, with Insets for Broaching and Marking Detail, 1946. Fig. 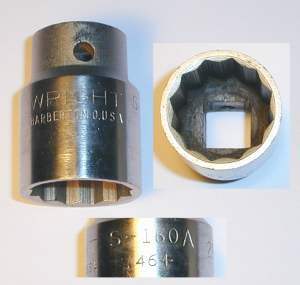 8 shows a 1/2-drive Wright S-160A 29/32 socket, marked "Barberton O. USA" with a "46+" date code. The finish is chrome plating with polished upper walls. 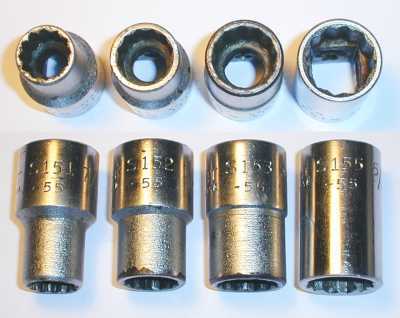 In 1955 (or earlier) Wright changed the design of its 1/2-drive sockets to use a simple cylindrical form for some of the larger (between 5/8 and 1 inch) sizes, in place of the reduced base used previously. This was probably done to simplify the finishing steps, as the simpler shape could be given a fully polished finish. Sockets in the smaller sizes continued to have polished bases with satin finish upper walls, and sockets greater than 1 inch continued to have reduced bases with polished upper walls. Fig. 9. Wright S-16x 1/2-Drive Sockets, with Insets for Broaching and Marking Detail, 1955. Some examples of the new design are shown in Fig. 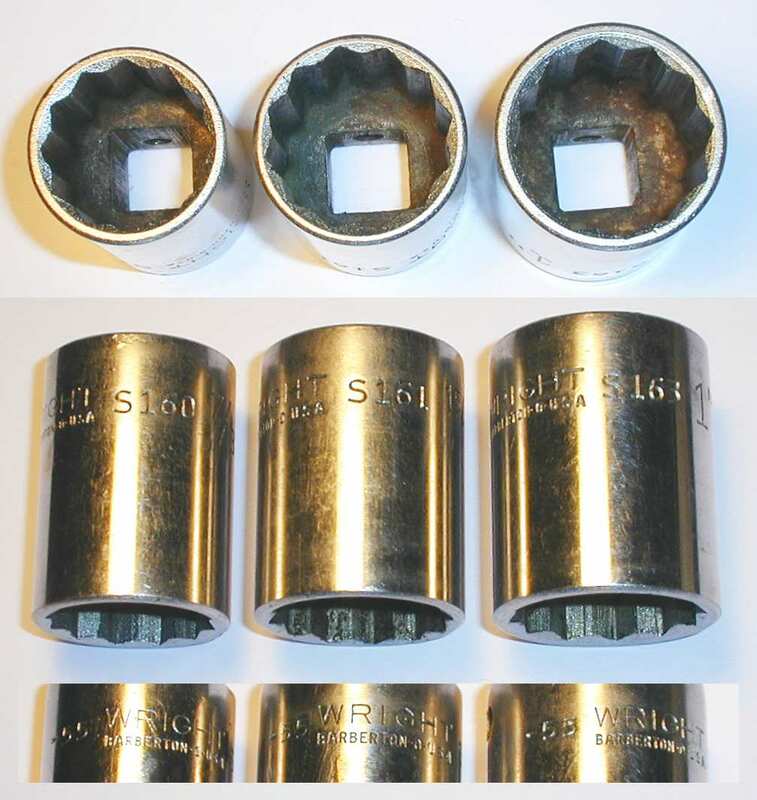 9, a group of three 1/2-drive Wright S-16x sockets from 1955, each marked "Barberton-O-USA" with a "-55" date code. The models and sizes are, from the left, S160 (7/8), S161 (15/16), and S163 (1 inch). The socket redesign of 1955 didn't affect the smaller sizes, which retained their polished bases and satin-finish upper walls. Fig. 10. Wright S-15x 1/2-Drive Sockets, with Inset for Broaching, 1955. Fig. 10 shows a group of four smaller 1/2-drive Wright S-15x sockets from 1955, each marked "Barberton-O-USA" with a "-55" date code. The models and sizes are, from the left, S151 (7/16), S152 (1/2), S153 (9/16), and S155 (5/8). The finish is chrome plating. The smaller socket sizes (less than 5/8) have polished bases and satin upper walls, and the 5/8 socket is the cross-over size to the fully-polished cylindrical form. In the late 1950s Wright developed a new type of socket broaching capable of fitting both a square and hex nut of the same size. 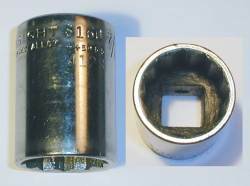 The resulting products were called "Ten Point" sockets. Fig. 11. Wright 4FS16 1/2-Drive 1/2 Socket, with Inset for Broaching and Marking Detail, 1958. Fig. 11 shows a 1/2-drive Wright 4FS16 socket, marked "Ten Point" and "Patent Pending" with a "58" date code. The patent corresponding to the pending status is not yet known. In 1960 Wright updated its model numbers to a new all-numeric system. In preparation for the change, some sockets and drive tools were marked with both old and new model numbers, beginning in 1959 or possibly earlier. Fig. 12. Wright S160 (4128) 1/2-Drive 7/8 Socket, with Inset for Broaching, 1959. Fig. 12 shows a 1/2-drive Wright S160 7/8 socket, marked "Forged Alloy" with a "++59++" date code, and with the new "4128" model number. This socket was acquired as part of the K4S14 Socket Set shown in a later figure. Fig. 13. Wright N17 1/2-Drive Flex Handle, with Inset for Marking Detail, ca. 1930s. Fig. 13 shows an early 1/2-drive Wright N17 flex-head handle, stamped "Barberton, O. U.S.A." at the base of the knurled handle. The overall length is 12.3 inches, and the finish is plain steel. This tool is not marked with a date code, suggesting that it may predate the date code system. Fig. 14. Wright N60 1/2-Drive Reversible Ratchet, with Inset for Side View, 1942. Fig. 14 shows an early 1/2-drive Wright N-60 reversible ratchet, stamped "Barberton, Ohio" with an "AC -42" date code. The overall length is 10.6 inches, and the finish is plain steel. Fig. 15. Wright N18 1/2-Drive Flex Handle, with Insets for Marking Detail, 1955. Fig. 15 shows a 1/2-drive Wright N18 flex-head handle, marked "Barberton-O-USA" with a "-55" date code. The overall length is 18.1 inches, and the finish is chrome plating. The handle has a knurled gripping surface and is equipped with a cross-bar hole. Fig. 16. Wright N23 (4432) 1/2-Drive Flex Handle, with Inset for Marking Detail, 1960. Fig. 16 shows a 1/2-drive Wright N23 flex-head handle with a cushion-grip handle, marked with a "-60" date code plus the new "4432" model number. The overall length is 12.3 inches, and the finish is chrome plating. This flex handle shows an early example of Wright's rubber cushion-grip handle, later patented as #D199,149. Fig. 17. Wright K4S14 1/2-Drive Socket Set, 1960. Fig. 17 shows a Wright K4S14 1/2-drive socket set in a metal case, marked "Wright Tool and Forge Company" and "Barberton, Ohio, U.S.A." on the decal on the cover. The model number for the set is not marked, but was identified by a catalog reference as a K4S14 (or similar) set. The set consists of an N23 flex-head handle with a cushion-grip handle, plus twelve 12-point sockets ranging in size from 7/16 up to 1-1/8. The sockets and tools in the set all had date codes from 1959 or 1960, and all were double-marked with both older and newer model numbers. Several sockets were missing, so these have been filled in with appropriate pieces from our inventory. The decal notes that the tools are made from AISI 4140H alloy steel. The socket models and sizes are, from the left, S151 (7/16), S152 (1/2), S153 (9/16), S155 (5/8), S156 (11/16), S157 (3/4), S159 (13/16), S160 (7/8), S161 (15/16), S163 (1 Inch), S164 (1-1/16), and S166 (1-1/8). The new model numbers in the 41xx-series range from 4114 to 4136, with the last two digits specifying the size in 32nds. Fig. 18. Wright 4400 1/2-Drive Ratchet, with Insets for Side View and Marking Detail, 1973. Fig. 18 shows a 1/2-drive Wright 4400 ratchet with a soft hand grip, marked "USA" with an "N" date code on one side, with "Pat. D.199149" and "Oil Only" on the reverse. The overall length is 10.6 inches, and the finish is chrome plating. The patent notice refers to design patent #D199,149, issued to H.T. Greenlee in 1964. The patent illustration shows a ratchet with a hand grip of this style. Fig. 19. Wright 4425 1/2-Drive Ratchet, with Insets for Side View and Marking Detail, 1979. Fig. 19 shows a 1/2-drive Wright 4425 long-handled ratchet, stamped "USA" with a "W" date code on one side, with "Pat. D.199149" and "Oil Only" on the reverse. The overall length is 15.1 inches, and the finish is chrome plating. The patent notice refers to design patent #D199,149, issued to H.T. Greenlee in 1964. Fig. 20. Wright N500 1/2-Drive Dual-Pawl Ratchet, with Insets for Side View and Reverse Detail, 1960. Fig. 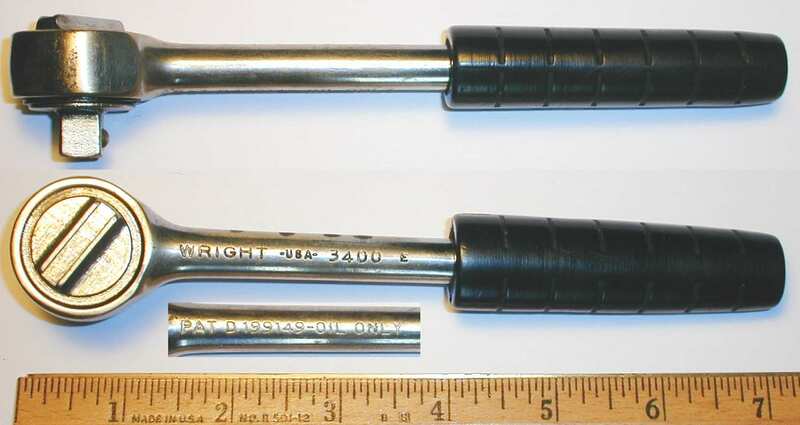 20 shows a 1/2-drive Wright N500 dual-pawl ratchet with a soft-grip handle, stamped with "Wright" and the model number on one side, with "Pat. Pend." and a "-60" date code for 1960 on the reverse. The pending status probably refers to design patent #D199,149, issued to H.T. Greenlee in 1964. Fig. 21. Wright 4435 1/2-Drive Flex-Head Handle, with Inset Marking Detail, 2003. Fig. 21 shows a recently made 1/2-drive Wright 4435 flex-head handle, stamped "USA" with a "G03" date code. The overall length is 18.0 inches, and the finish is polished chrome. The flex head is equipped with seven detent positions, to help hold the head in the desired position. The "G03" date code is believed to indicate production in 2003, although we don't have positive confirmation of the late date code series. Fig. 22. Wright N12 1/2-Drive 5 Inch Extension, with Inset for Marking Detail, 1955. Fig. 22 shows a 1/2-drive Wright N12 5 inch extension, marked "Barberton-O-USA" with a "-55" date code. The overall length is 4.9 inches, and the finish is chrome plating. The extension is equipped with a cross-bar hole for use as a T-handle. Fig. 23. Wright 4405 1/2-Drive 5 Inch Extension, with Inset for Marking Detail, 1965. Fig. 23 shows a 1/2-drive Wright 4405 5 inch extension, stamped "USA" with an "E" date code. The overall length is 4.9 inches, and the finish is polished chrome. Fig. 24. Wright N13 1/2-Drive 10 Inch Extension, with Inset for Marking Detail, 1955. Fig. 24 shows a 1/2-drive Wright N13 10 inch extension, marked "Barberton-O-USA" with a "-55" date code. Fig. 25. Wright MN15 3/8-Drive Speeder, with Inset for Marking Detail. Fig. 25 shows an early 3/8-drive Wright MN15 speeder, stamped with the Wright name and model on the end piece. The overall length is 17.2 inches, and the finish is plain steel. The end piece is also marked with a small "J" code, barely visible to the right of the model number in the inset. It's not known whether this represents an early date code. Fig. 26. Wright MN60 3/8-Drive Ratchet, with Inset for Side View, 1942. Fig. 26 shows an early 3/8-drive Wright MN60 ratchet, marked "Barberton, O. USA" with "AC" and a "42+" date code. The overall length is 7.0 inches, and the finish is plain steel with traces of cadmium plating. This ratchet has an unusual design not seen previously in other tools. A single pivoting pawl is held in place by the large center screw, and the shift lever moves a spring-loaded plunger to change the bias of the pawl. Fig. 27. Wright MN13 3/8-Drive 11 Inch Extension, with Insets for Marking Detail, 1954. Fig. 27 shows a 3/8-drive Wright MN13 11 inch extension, marked "Barberton O. USA" with a "54+" date code for 1954. The overall length is 11.4 inches, and the finish is chrome plating. Fig. 28. Wright 3400 3/8-Drive Ratchet, with Insets for Side View and Marking Detail, 1965. Fig. 28 shows a 3/8-drive Wright 3400 ratchet with a soft hand grip, marked "USA" with an "E" date code on one side, and with "Pat. D.199149" and "Oil Only" on the reverse. 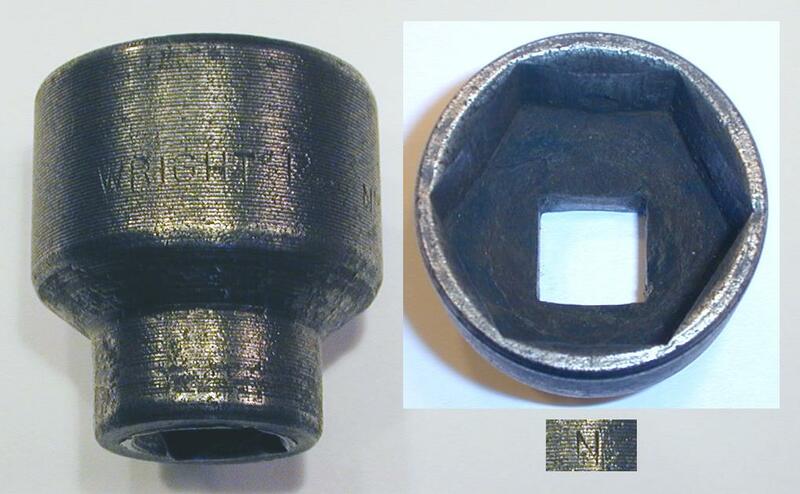 As with the previous figure, this ratchet is covered by design patent #D199,149, issued to H.T. Greenlee in 1964. Fig. 29. 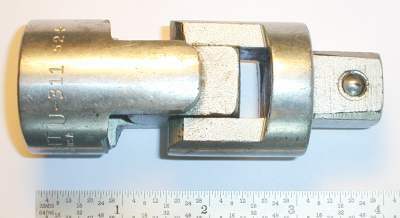 Wright 3428 3/8-Drive Flex-Head Ratchet, with Inset for Side View, 1973. Fig. 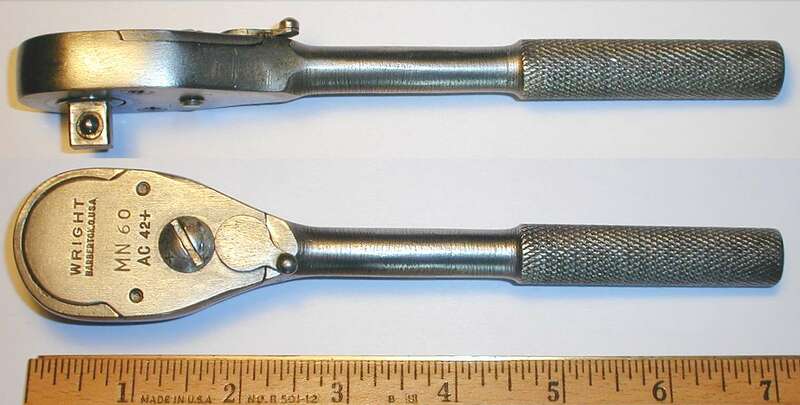 29 shows a 3/8-drive Wright 3428 flex-head ratchet with a soft hand grip, marked "USA" with an "N" date code on the shank. The reverse (not shown) is marked "Pat. D.199149" and "Oil Only" as in the previous example. The overall length is 10.7 inches, and the finish is chrome plating. The soft-grip handle is covered by design patent #D199,149, issued to H.T. Greenlee in 1964. Fig. 30. Wright 3403 3/8-Drive Extension, with Insets for Marking Detail, 1961. Fig. 30 shows a 3/8-drive Wright 3403 extension, marked "Forged Alloy" with a "61" date code for 1961. The overall length is 2.9 inches, and the finish is chrome plating. Fig. 31. Wright V-17 1/4-Drive Flex Handle. Fig. 31 shows a 1/4-drive Wright V-17 flex-head handle, marked "Barberton O. USA" on the shank. The overall length is 5.8 inches, and the finish is chrome plating. Fig. 32. Wright 2435 1/4-Drive Flex Handle, ca. 1960+. Fig. 32 shows a 1/4-drive Wright 2435 flex handle, stamped "USA" on the shank. This tool is not marked with a date code, but the all-numeric model number indicates production in 1960 or later. Fig. 33. Wright U-311 3/4-Drive Universal, 1952. Fig. 33 shows a 3/4-drive Wright U-311 universal, marked "Barberton-O-USA" with a "52+" date code. The overall length is 3.8 inches, and the finish is chrome plating. Fig. 34. Wright N-313 3/4-Drive 16 Inch Extension, with Inset for Marking Detail, 1952. Fig. 34 shows a 3/4-drive Wright N-313 16 inch extension, marked "Barberton-O-USA" with a "52-" date code. The overall length is 15.7 inches, and the finish is chrome plating. Fig. 35. 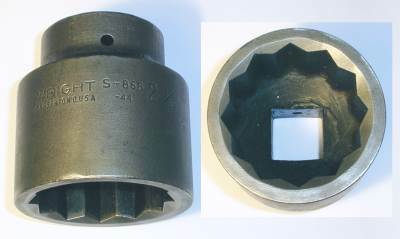 Wright S-868 1 Inch Drive 2-1/8 Socket, with Inset for Broaching, 1944. Fig. 35 shows a 1 inch drive Wright S-868 2-1/8 socket, marked "Barberton O. USA" with a "-44" date code. The inset shows the broaching and hot-forged construction of the socket. The bottom of the socket is still covered by cosmoline, a protective coating used to prevent rust in storage. Fig. 36. Wright 8417 1 Inch Drive 17 Inch Extension, with Inset for Marking Detail, 1978. Fig. 36 shows a 1 inch drive Wright 8417 17 inch extension, marked "USA" with a "U" date code. The overall length is 16.9 inches, and the finish is chrome plating. After operating exclusively as a maker of socket and drive tools during the 1950 and early 1960s, by 1968 Wright had returned to offering a full line of tools. Fig. 37. Wright 1120 5/8 Combination Wrench, with Insets for Side View and Reverse Detail, 1969. Fig. 37 shows a Wright 1120 5/8 combination wrench, marked "USA" with "Forged Alloy" and a "J" date code on the reverse. This wrench is a less common example of a non-socket tool marked with an apparent date code. Fig. 38. Wright 1322 5/8x11/16 Open-End Wrench, with Inset for Reverse Detail, 1969. Fig. 38 shows a Wright 1322 5/8x11/15 open-end wrench, marked "USA" with "Forged Alloy" and a "J" date code on the reverse. The overall length is 7.2 inches, and the finish is chrome plating with polished faces. In this section we'll look at examples of tools made by Wright but marked with other companys' brands.